My mom makes a great apple cake. It's baked in a tube pan, loaded with cinnamon, and drizzled with a brown sugar glaze. Anytime I go over for dinner in the fall, it's the dessert I expect/demand. She's made it all my life and it tastes like home. But it's her cake and I'm grown; it's time I find my own apple cake. 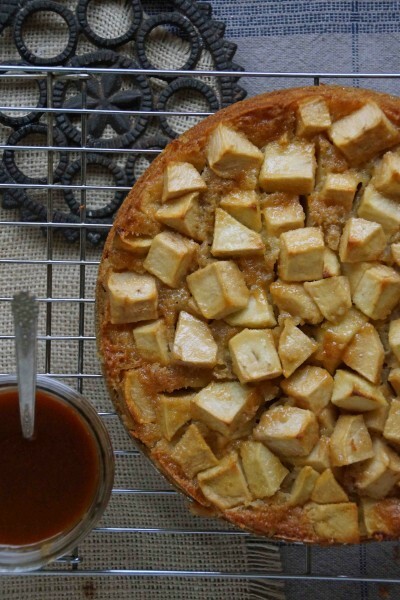 An apple cake that tastes like my home. So I'm on the prowl for apple cake recipes. I'm looking for unfussy, rustic cakes, that can be pulled together in a moment's notice. I'm looking for the kind of cake you can quickly mix up when you get a "is it alright if I stop by in an hour?" call. The kind of cake you can have in the oven 10 minutes after that call, its aroma filling your house with everything good about fall as you race around, shoving unmentionables under the bed and attempting to eliminate the dog hair tumbleweeds from every corner. My first contender is a (slight) adaptation of a French apple cake that I found on David Lebovitz's website but is actually from one of Dorie Greenspan's cookbooks. It's a dead simple apple cake that is made with ingredients you will most likely already have on hand. I chose to serve it with caramel sauce this time around, but I think it would be just as nice plain with your morning coffee or an afternoon cup of tea. Company's coming...let's get this apple cake in the oven. 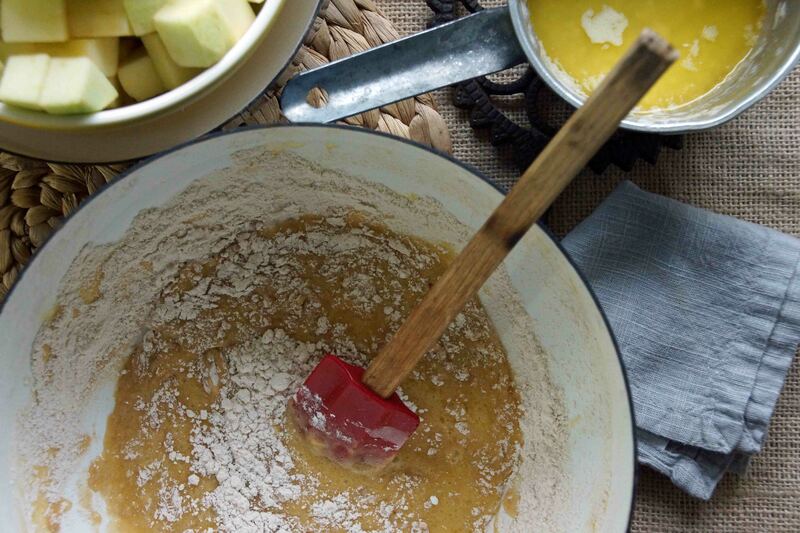 Grab a few apples and some baking essentials: flour, sugar, butter, and eggs. I'm adding a pinch of cinnamon, a sprinkle of nutmeg, and a splash of brandy to jazz things up a bit. Melt the butter, combine the flour with spices and baking powder, whisk the eggs with sugar and brandy. Stir the dry ingredients into the wet, alternating with additions of melted butter. 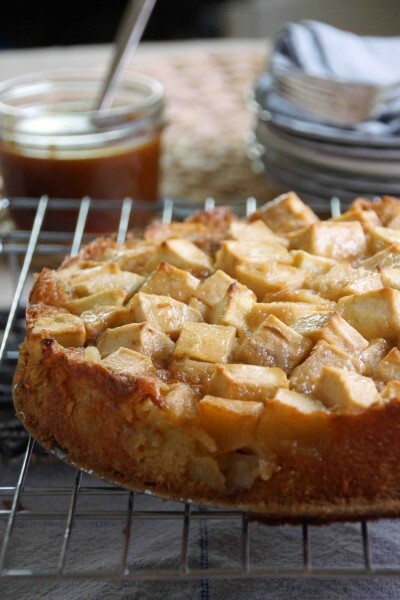 Fold in the chunks of apple and transfer the batter to a buttered springform pan. 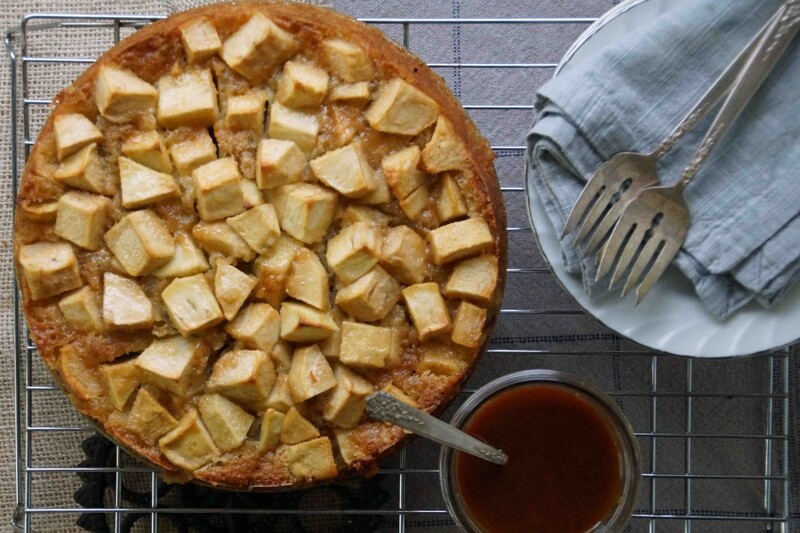 This cake is heavy on the apples, light on the batter. I'd say that gives us clearance to make a caramel sauce to drizzle over the top. 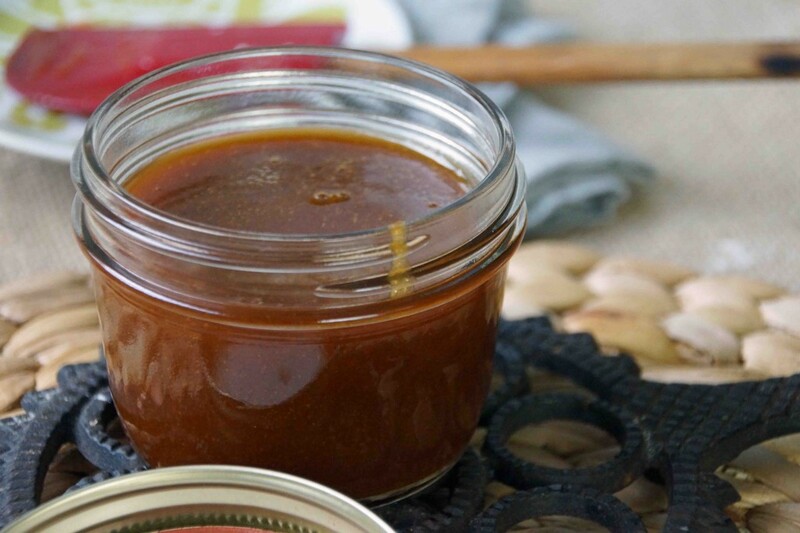 While the cake bakes, make the caramel sauce. Dissolve sugar in water and boil until it becomes a dark amber color. Pull it off the flame and stir in butter, a pinch of salt, and a drizzle of cream. Whoa...too good. I poured mine in a little jar and put it out of sight until it was cake time, otherwise I might have "tasted" it until it was empty. Pull the cake out of the oven and let it cool slightly. Cut it into wedges, top with a scoop of ice cream, drizzle with caramel, and ask yourself if this cake is the one. So is it? Is it the one? Have I found my apple cake? I can't be sure just yet, but I do know this one's going to be a tough act to follow. 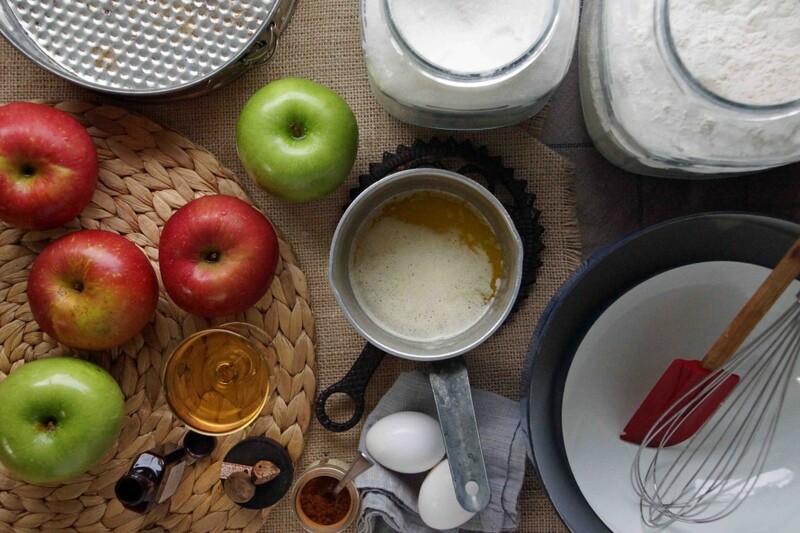 Do you have a go-to apple cake recipe? I'd love to know yours...feel free to share in the comments section! This simple cake can be put together in minutes. Enjoy it with the caramel sauce as suggested below or on its own with a dollop of softly whipped cream or crème fraîche. Preheat oven to 350°. Thoroughly butter a springform pan. 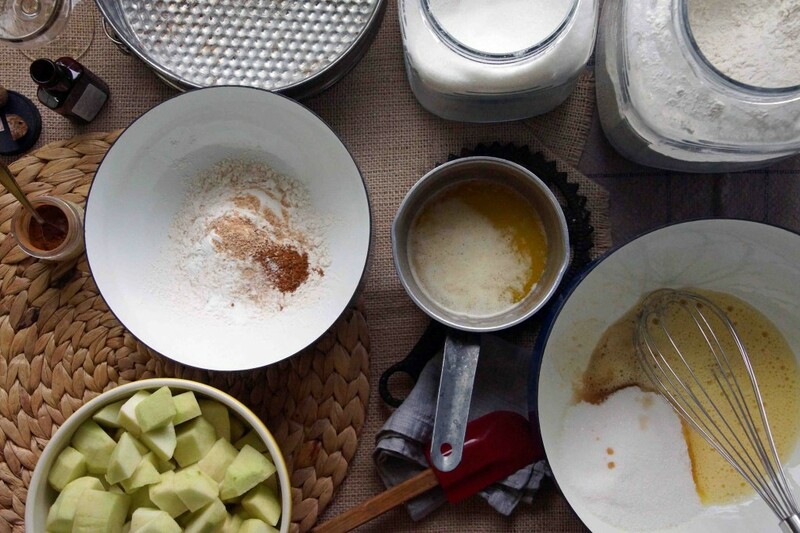 In a medium bowl, whisk together flour, baking powder, a pinch of salt, cinnamon, and nutmeg. In a large bowl, whisk together the eggs and sugar until light and frothy. Beat in the brandy and vanilla. Stir half of the flour mixture to the egg mixture. Add half of the melted butter, stir, then add the remaining flour, followed by the remaining butter. 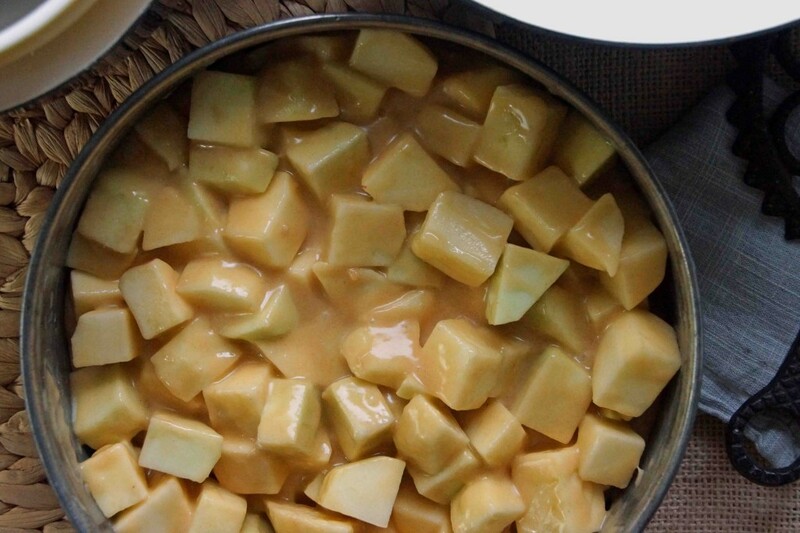 Fold the apples into the batter and transfer the batter-coated apples to the prepared pan. Set the springform pan on a baking sheet (your guests will NOT be impressed when they walk into a smoke-filled house and the fire alarm is going off–trust me!) and bake until the center of the cake is set and a tester comes out clean. Mine took about 1 hour, 10 minutes, but I’d start testing around 50 minutes as baking times are likely to vary based on the size/moisture content of your apples. Let the cake cool for a few minutes in the pan, then run a knife around the edges, and remove the springform. Allow to cool slightly, then serve with ice cream, whipped cream, or crème fraîche and a drizzle of caramel sauce. While the cake bakes, make the caramel. 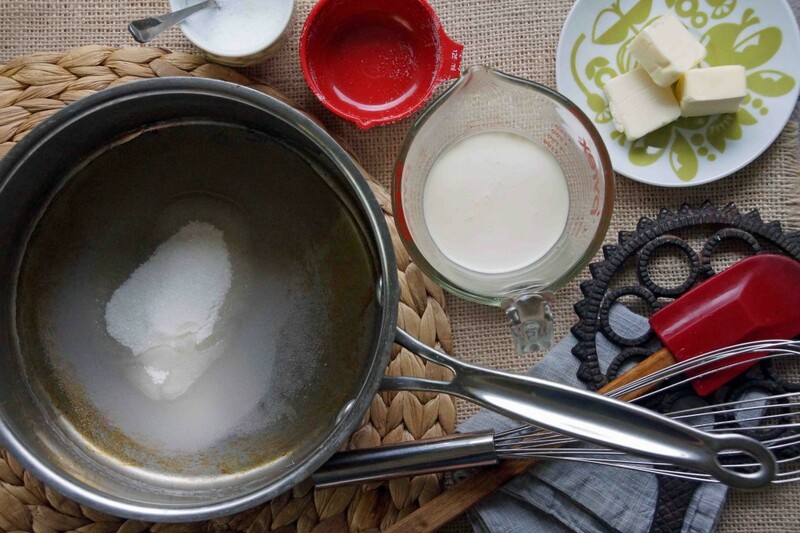 Place the sugar and water in a large saucepan over medium-high heat and whisk to dissolve. Cook until the mixture become dark amber in color, about 10 minutes. Remove from the heat, stir in the butter, then slowly stir in the cream and salt. Drizzle over cake. Any leftover sauce can be refrigerated and reheated in a water bath to a pourable consistency. 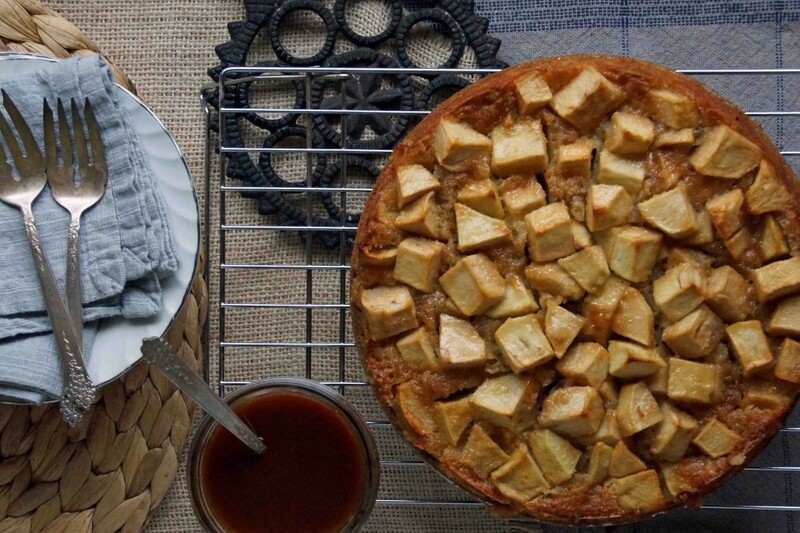 I’ve never actually made apple cake, but all this talk of fall on the blogosphere lately has got me craving cinammon/apple/nutmeg flavours like never before. This looks super delicious as well, thank you for sharing – it’s saved in my recipe folder now! This sounds and looks wonderful! Your photography is amazing! Looks scrumptious! 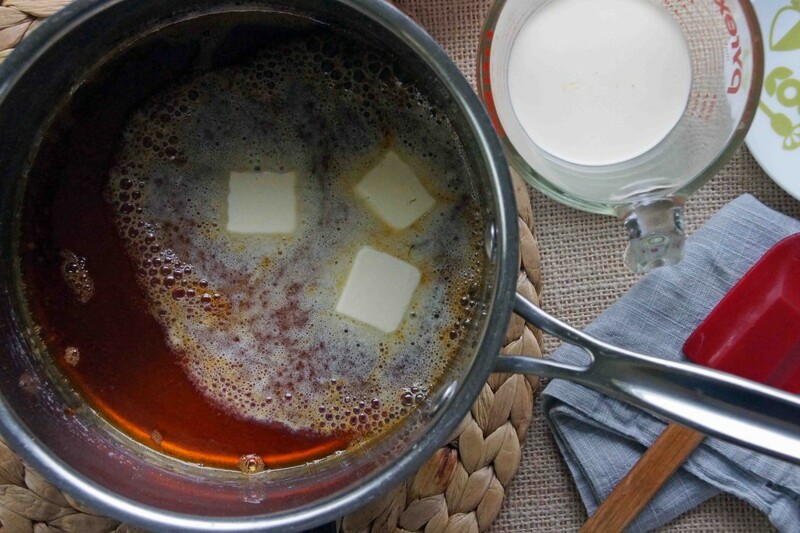 Can I use brown sugar instead of white in the caramel sauce? Is there room for a splash of brandy or Calvados in the sauce as well or is that gilding the lily? Fortunately I will have company this weekend so I can justify making the cake. Try it! I bet it’ll work out just fine and be extra delicious, besides half the fun of cooking/baking is experimenting. I like this better than my recipe (maybe it’s the brandy?) I’ll be over in an hour! Streusel!!! My next take on apple cake will definitely involve streusel! I checked out your blog. It’s beautiful, especially considering you just launched it! I made this cake this weekend – absolutely delicious!! I substituted Trader Joe’s Gluten Free flour with great success. I skipped the caramel sauce and it was still perfect. Thank you for a new fall favorite recipe. Glad you liked it and I’m sure others will be happy to know that it can be made gluten free! Hi! Commenting once again on your exquisite photography! You are SO talented, IMHO! May I ask what camera you use? As to this recipe, I have made Dorie’s original (Marie-Helene’s Apple Cake) twice, once with Disaronna, once with rum. I liked the Disaronna version best, but either way, it was absolutely delicious! Next, I’m going to try YOUR version. Love the idea of the spices. If it’s anything like your photos, I’m in for a treat! Hi Cheryl! Thank you so much! I’m not a terribly confident photographer, so I always appreciate a complement. I use a Sony A65 with a Tamron 18-270mm f3.5-6.3 lens. I will have to try the apple cake with Disarrono–sounds delicious!